6:30 PM - Lecture by Bruce King (book signing to follow after the lecture). 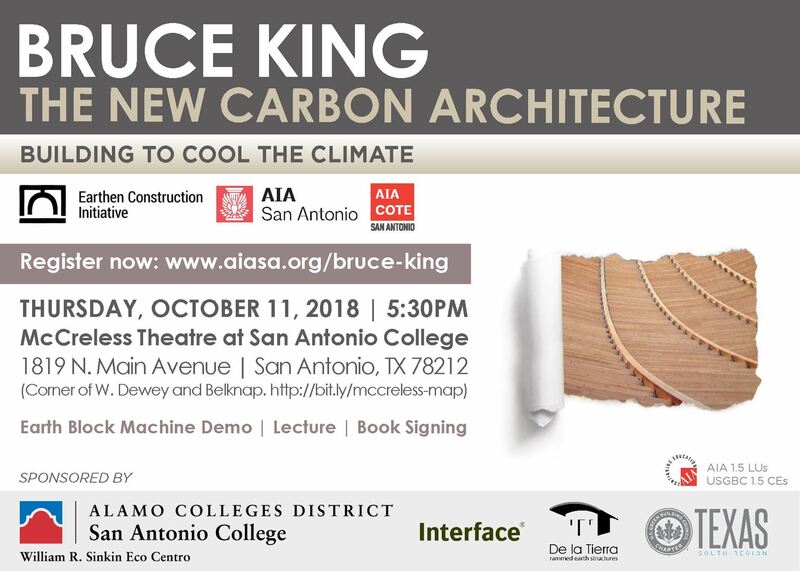 Bruce King, author of The New Carbon Architecture, will lecture at McCrelless Theatre on Thursday, October 11, 2018. The evening begins with an Earth Block Machine Demonstration hosted by Advanced Earthen Construction Technology (AECT) at 5:30 p.m. Doors open at 6:00 p.m. for refreshments, including a cash bar. The lecture starts at 6:30 p.m., followed by a book signing hosted by The Twig Book Shop. Registration is available online: https://aiasa.org/bruce-king. This event qualifies for 1.5 LUs from AIA and 1.5 CEs from USGBC. "Green buildings" that slash energy use and carbon emissions are all the rage, but they aren’t enough. The hidden culprit is embodied carbon―the carbon emitted when materials are mined, manufactured, and transported―comprising some ten percent of global emissions. With the built environment doubling by 2030, buildings are a carbon juggernaut threatening to overwhelm the climate. Like never before in history, buildings in San Antonio and beyond can become part of the climate solution. With biomimicry and innovation, we can pull huge amounts of carbon out of the atmosphere and lock it up as walls, roofs, foundations, and insulation. King will speak about paradigm-shifting innovations in architecture and construction that are making this happen. Share this event with your friends on Facebook. View the event flyer here. Bruce King is a registered structural engineer, author of several books, a private consultant and a leader in the green building movement for more than 25 years. He has served as a Green/Clean Tech advisor to numerous startups and other organizations, worked on high-rise structures in San Francisco, Buddhist monasteries in the Colorado Rockies, passive solar designs all over the world, and hundreds of houses of every shape throughout North America. King is co-founder and Director of Ecological Building Network (EBNet), a nonprofit coalition of engineers, builders, and architects developing and disseminating best technologies for the built environment. This event is hosted by Earthen Construction Initiative (ECI) and American Institute of Architects San Antonio, Committee on the Environment (AIA-COTE), and sponsored by William R. Sinkin Eco Centro at San Antonio College. Additional sponsors include De la Tierra, Interface, and the U.S. Green Building Council, South Texas Region. Please contact sac-ecocentro@alamo.edu ASAP to sign up as a volunteer. Volunteers get into the event for free.